Greetings, new members! I hope you managed to survive the snowfall of last week without any traffic accidents or lack of electricity, and that this week your classes and meetings and daily tasks are comfortably back on schedule. Remember our last blog post, when I wrote about Conference Reimbursement? I just want to emphasize how fortunate we are to have a faculty union that negotiated, and continues to protect, our right to funding for professional development. $1700 per person, particularly when multiplied by our membership, seems like a lot of money, doesn't it? And, of course, it is -- but we have to remember that $1700 is intended to stretch across two years. If you're familiar with the rising cost of airfare -- and/or the astronomical costs of staying in "the" conference hotel for the duration of a conference -- you'll know that this $1700 is not going to last beyond, well, one or two conferences (depending, of course, on how long you stay and how far away the conference is located). Conferences (and the books you purchase at them) are expensive. In your first years as a tenure-track faculty member, you'll be expected to stay current in your field by attending relevant local and/or regional conferences. There's no magic number -- although I'd suggest that a minimum of one per year demonstrates a comfortable commitment to one's professional development. With each subsequent promotion, however, and as with most aspects of your career, the stakes are raised the higher you climb toward full Professor or PA 2 or Specialist 2. You'll be expected to attend -- and eventually present at -- larger, more widely-recognized events on a national scale. This, of course, will take money. 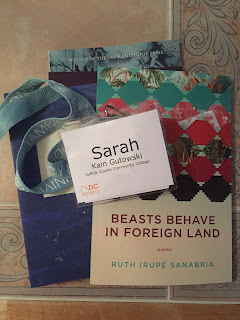 My trip to LA in March of last year, for instance, to attend the annual conference of the Association of Writers and Writing Programs (AWP), cost well over $1700. Such is life -- it's the premier conference in my field and I was presenting on a panel, so I said "bye-bye" pretty swiftly to my conference allowance. SO. When I attended AWP last week in Washington, D.C., I had to pay out of pocket with no chance of reimbursement for my expenses, right? Not necessarily. Because, well, I'm a planner by nature, I knew I'd want to attend the conference this year. Additionally, I knew that the Faculty Association has ALSO negotiated with the college and county for additional funds for faculty development and retraining: $30,000 per year, to be exact. Assistance for the next academic period is awarded to faculty who apply by April 15 of each year. The committee that oversees these applications awards funds first and foremost to faculty who require retraining. Then, after retraining needs have been met, those faculty who have applied for assistance for faculty development (like my attendance at the summer writers' conference) are awarded based on the strength of a faculty member's application and the amount of money still available in the fund. So if you anticipate attending a conference or two next year -- and if you suspect you'll use your entire $1800 conference allowance pretty early, like yours truly (remember, the amount increases in September) -- you should consider applying for Faculty Retraining and Development assistance this spring. One way to make sure you understand the process and follow it correctly is to attend a Faculty Retraining and Development workshop one of our three campuses this semester, held by new FA Secretary Cynthia Eaton. Wednesday, February 15 (tomorrow!) on the Grant Campus in Captree 104. Wednesday, February 22 (next week!) on the Eastern Campus in Corchaug 18. Of course, if you can't make either of these workshops, simply email Cynthia Eaton with your concerns at cynthia [at] fascc.org. She'll be happy to help. Or ask your mentor, who may be able to answer your questions after having gone through the process him or herself.